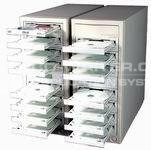 The 1 to 14 Power Tower can duplicate up to 14 DVDs simultaneously. This versatile duplicator will also copy CDs. An optional removable hard drive allows users to store data and an optional USB connection allows users to transfer data directly from a PC. All command operations for the 1 -6 PowerTower copier are entered via an easy to follow control panel. Simply load the drives with blank discs, insert your master into the CD-ROM drive at the top of your tower and press enter. Your PowerTower duplicator will not only automatically detect the type of CD or DVD master (CD ROM, CD-XA etc.) without any user intervention, but will also provide "frame accurate" Data and Audio including UPC, ISRC and audio indexes. In addition, the compare master and compare copy feature, allow both CDs/DVDs and images to be verified for complete data integrity assurance. Power . Tower . 14 . DVDs . Copytrax .